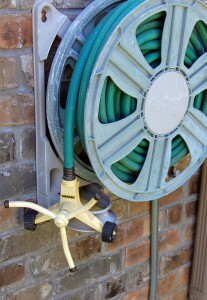 If you’ve tried watering your yard with a hose attached to any of the many broadcast sprinkler devices, you’ve certainly thought “there must be a better way.” The underground sprinkler system ranks right up there with the wheel as one of civilization’s greatest inventions. If you don’t have a sprinkler system, The Greener Side professionals can install one for you, specifically designed to deliver exactly the right irrigation to your yard and flower beds. 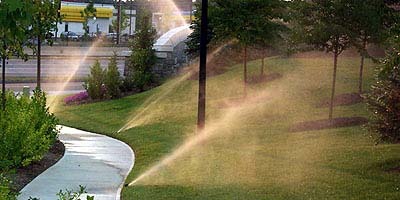 Our professionals also perform routine sprinkler maintenance, such as repair or replacment of damaged sprinkler heads or freeing heads from yard growth, and verifying the system delivers proper yard coverage. We’ll even handle programming that mysterious control box in your garage. Properly installed and maintained sprinkler systems make your life easier by supplying your plants with the right amount of irrigation at the proper time of day, and assuring you are in compliance with local water-use restrictions. The Greener Side provides your sprinkler system installation or service, you benefit by our personal service and ongoing follow-up. And we’re probably less expensive than those companies doing only sprinkler systems. For more information, email: click here to go to our “Contact” page.